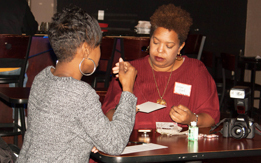 Local entrepreneurs participated in Speed Networking Event held at Club Evolution on December 4 2017. Participants are given a number from 1-4; each set of tables is given a color: red or blue. The host announces which numbers should sit across from each other at which color-coded location. Each session is three minutes. 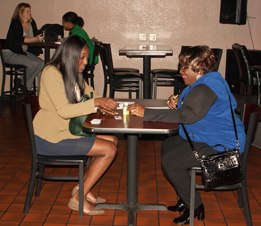 If there is a match, participants exchange business cards. If there is no match there is no pressure to share contact information. The purpose of the time limits is for everyone to meet everyone else in the room. 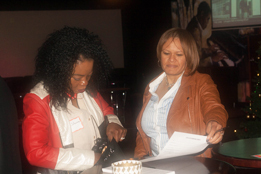 There were several social media breaks throughout the session, raffle giveaways and of course great conversation. 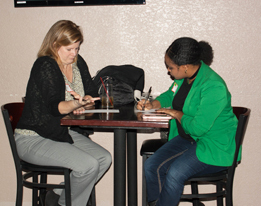 Speed Networking occurs once every quarter at Club Evolution hosted by Fruition owners Valerie Thompson and Tera Johnson. 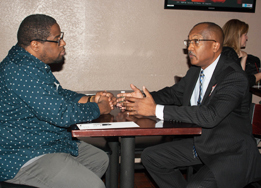 The two joined forces in an attempt to bring together minority business owners with fun and free networking events which results. Thompson is a graphic designer and University of Toledo alumna and owns her own business, LEAP Graphics, which focuses on corporate event design, established in 2005. Leap Graphics helps plan, design and coordinate the production of invitation packages, displays and collateral for corporate events. They assist program directors, event coordinators, fundraisers and marketing professionals in bringing their companies’ event theme to life through smart strategy and compelling graphics. Johnson has been baking all her life. She is the owner of Sweet Experience, cheese cakes in a jar. Johnson said she and Thompson wanted to provide resources for small businesses to develop a 30 second pitch. They have been holding speed networking events for a year at Evolution. 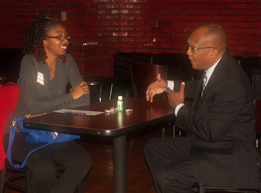 If you want to participate in the next Speed Networking event Feb 5 RSVP on Eventbrite and follow on social media @Fruition419 and Club Evolution.